TVS has launched its new bike TVS Apache RTR 220 to compete with the latest bikes in the present scenario of cut throat competition. With its appealing looks and powerful performance the bike is sure to rule the heats of many bike enthusiasts in India. 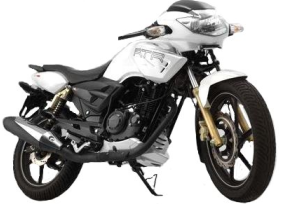 TVS Apache RTR 220 comes in 4 beautiful colors – Black, Grey, White and Yellow. Big headlamps and large fuel tank cowl provide a sturdy look to the bike. The black alloy wheels, Naked Chain Cover, LED Tail Lights, Parking Lights and Wide Tubeless Tyres provide a sporty look to the bike. TVS Apache RTR 220 has introduced many comfort features for the rider. The self start bike has Digital Fuel Gauge, Analogue Tacho Meter, Digital – 2 Trip Meter, Digital Speedometer and Passenger Footrest. Other comfort features include Step-up Seat, Pass Light, Low Fuel Indicator, Low Oil Indicator. TVS Apache RTR 220 has various safety features. The large petal shaped 270 mm Front disc brakes with 200 mm rear disc brakes de-accelerates quickly and increases safety. Location of switches is such that they are easily accessible at the handles, without distracting the eyes from road. The bike is loaded with advanced suspension system with new generation Poly shock absorbers that reduce jerks and bumps and give comfortable ride. The bike has Telescopic Forks, 105 mm Stroke front shock absorbers with Mono tube inverted, Gas Filled Shox (MIG) with Spring Aid rear shock absorbers. TVS Apache RTR 220 has three variants. The base variant has 159.7 cc, 4-stroke, Air cooled, Single Cylinder, petrol engine with five speed manual transmission gearbox. The engine produces a maximum power of 15.2 bhp at 8500 rpm and a maximum torque of 13.1 Nm at 6500 rpm. The second variant also has 159.7 cc engine with EFI technology. It produces a maximum power of 15.7 bhp at 8500 rpm and a maximum torque of 13.1 Nm at 6500 rpm. The top end variant has 177.4 cc, Single Cylinder, Four Stroke, EFI petrol engine with five speed manual transmission gearbox and produces a maximum power of 17.3 PS at 8500 rpm and a maximum torque of 15.5 Nm at 6500 rpm. The price of TVS Apache RTR 220 is Rs. 95000 (taking Mumbai as base price location). However, the price specified is indicative price only and reflects lowest approximate price which excludes tax, registration, insurance and cost of accessories.